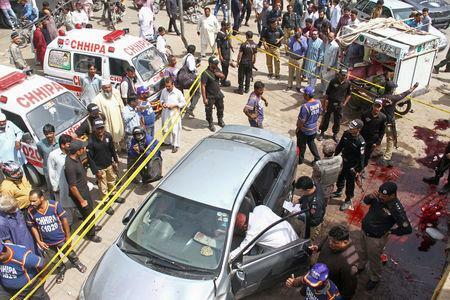 The attack in an eastern district of the port city infamous for its violence came as the cleric and former sharia judge of the country's Supreme Court, Mufti Muhammad Taqi Usmani, was heading to a mosque to lead Friday prayers. "Allah has been gracious, he is safe," the city's police chief, Amir Shaikh, told Reuters, calling the attack a conspiracy to sabotage peace in Karachi and the country. "They used multiple handguns," Raja Umar Khattab, a police officer of the Counter Terrorism Department of Sindh province, told Reuters. The attackers had followed the cleric's car for some distance and carried out surveillance of his route, he added. "Maulana Amir Shahab is in critical condition with gunshot wounds to the head," Dr Seemin Jamali of a nearby hospital, the Jinnah Postgraduate Medical Centre, told Reuters, adding that another person had been brought in dead. Crime in Karachi, from targeted killings to extortion, has fallen sharply since a campaign to rein it in began in 2013, led by Pakistan's paramilitary Rangers. As a judge on the shariat appellate bench of Pakistan's Supreme Court from 1982 to 2002, Usmani specialised in Islamic jurisprudence and financial matters.